I am a salad-lover all year round, but when the temperature is pushing 90 there is nothing more refreshing than a cool crisp salad for lunch or dinner. I tasted this particular salad last summer, when my friend Jerra brought it to a lakehouse luncheon, and I have been making ever since. Not usually a fan of fruit on my salads, I fell in love with the texture and taste combo that the pear and blue cheese provided, and have been making this salad every since. The original recipe can be found on the REAL SIMPLE web site but the real secret is in the dressing (see below). It is definitely worth making your own rather than reaching for anything pre-made from the grocery store. Whisk together the above ingredients and drizzle over a bed of arugula (or mixed greens as I prefer) topped with pear chunks and crumbled blue cheese. 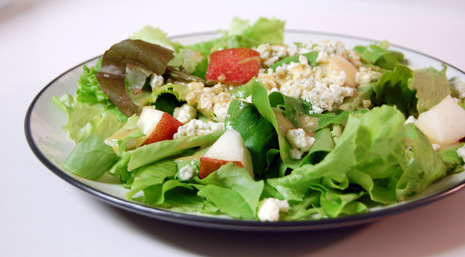 The sweet and tangy dressing perfectly compliment the sweet and strong flavors of the pear and blue cheese. Enjoy!